"What are The Three Steps like?" I heard a snort of laughter from the passenger seat as our driver asked the inevitable question about the ‘Snakes and Ladders’ race. I’m still not sure where then number three comes from, or where the steps are but it refers to a very large, very steep hill, on which the upper half is loose, powdery dirt. It never fails to get a mention in the race briefing and only the hardiest of trail runners will actually run up it. When I did this race two years ago it was the place I came unstuck. The start of the race was nice and cool. 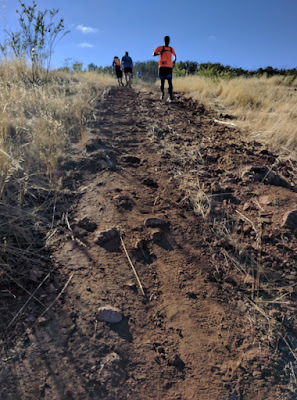 I stuck myself in the top third of the pack for a fast start, which then pretty much ground to a halt (or slow walk) as I gasped my way up the top of the first steep up-hill section. 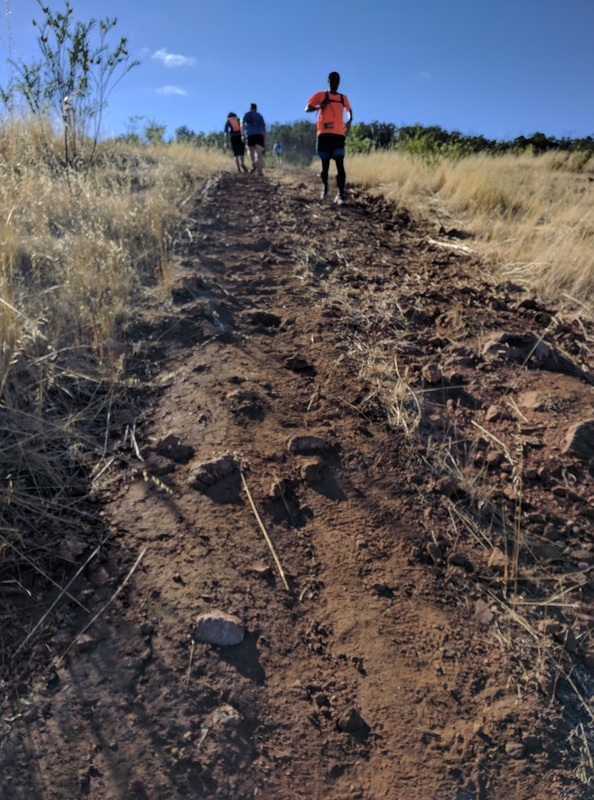 The field started to thin out in the woods towards the top of the first hill as the stronger runners kept on running and the slower flagged behind. A gradually undulating, wide trail, in the shade of the trees with only the sound of my foot falls and some tweeting birds was a welcome moment of peace. It didn’t last long before I was trying not to slide all the way down a pea-gravel covered slope and then out into the open again. As I was picking my way down the hill, up came the front runner for the long course, steaming back up. It makes you marvel at what human beings are capable of. Suddenly I was at the bottom of The Three Steps. My only goal was to make it up and back down again in one piece. Baby steps, I kept saying to myself. One foot in front/above another. Just. Keep. Going. And there I was, at the top. However, true to PTS form, the course didn’t turn around at the top, it diverted along the side of the hill for couple more minutes to an open patch where there’s a (literal) turning circle. Around the turning circle we all went and back down the treacherous, slippy-slidey dust pile. By this point I was tiring so my downhill was disappointingly slow as I just didn’t have the strength to be safe at speed. I was grateful to finish The Three Steps in one piece with only one dusty hand, which I had used to break an almost-fall. The remaining kilometres were a peaceful ramble along the Kitties Gorge trail (excepting the heart stopping moment when the person in front lost the trail - yes yes, I know I’m supposed to follow the blue flagging not the person in front of me). At the finish there were warm smiles, cold water melon slices and high fives. As we drove back to Perth, there was a quiet satisfaction that we had just conquered some good hills.